Why wouldn’t Saudi Arabia, Qatar, and all other wealthy Muslim countries fund ISIS, ISIL, or whatever we are calling the leading army of Mohammad this week? In the latest Wikileaks download, a series of emails between then Secretary of State Hillary Clinton and John Podesta, former Chief of Staff to President Bill Clinton and Counselor to President Obama, dated August and September 2014 reveal Saudi Arabia and Qatar are funding and providing support to ISIS. We know from the recently released portions of the 9/11 Report a large volume of evidence exists revealing Saudi Arabia funds jihadi training materials and Islamic Centers/Mosques in the United States, among other direct support to fund the global jihad against the U.S. and the West. Pakistan provided direct support via their intelligence agency (ISI) to Al Qaeda fighters after the attacks on the United States on 9/11/2001, and, provided safe haven for Osama bin Laden. Turkey’s policies and open hostility towards the United States make clear they cannot be trusted at all. 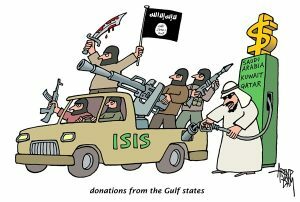 Saudi Arabia and Qatar are giving financial and logistical support to ISIS. *Why are key facilities in Saudi Arabia and Qatar not on our target list? *Which Muslim country in the world is not hostile to the United States and supporting the armies of Mohammad (ISIS, Al Qaeda, Hamas, etc)? Given that the RICO Act provides an abundance of causes for acting when dealing with criminal syndicates like the Muslim Brotherhood’s army of “Imams” who order others to carry out deadly Islamist terror attacks, thus are subject themselves to be tried — one might ask in behalf of the American people, (now that “Jimmie the Sledge” is headed for Coventry) what the hell do the Assistant Attorney General for National Security, and the Assistant to the President for Homeland Security and Counterterrorism, actually do besides keep their mouths shut regarding the plethora of federal crimes they ignore and watch the country edge closer each day to the perpetual control of a few self-serving families and oligarchic subversives. Furthermore, in addition to funding ISIS, ISIL and over thirty more sharia-adherent barbarian hordes slithering about looking for victims, Saudi Arabia swaps millions in oil money for political influence in the most prestigious universities & schools in the country. As for the 24 MOA training camps that are operational with respect to Phase-5, which UTT recently referenced, they may already have fallen under the control of a geosynchronous satellite calibrated for controlling A to G drone-loaded missiles, with respect to fire control, as well as maneuvering the bird. Actually, it comes as no surprise that Turkey’s President is hostile to the United States, inasmuch as he asserted publically more than 18 months ago that he wants to be the next caliph when the Global Islamic Movement takes over the world, And lest we forget, Ambassador J. Christopher Stevens’ nocturnal hush-hush boat trip to Libya was to meet a Turkish official in Benghazi to arrange the transport of American weapons through Turkey’s backdoor into Syria, thence into the hands of Islamic terrorists under the command of a prominent Saudi commander. One of the RINO deserters probably cooked the plan up on behalf of the “Military Industrial Complex” which General Eisenhower warned the country about. Ten-to-one Lady Liberty in New York harbor has a tear in each eye tonight, if so I can understand why.